Below are some guidelines for using and handling treated timber for your pergola, decking or verandah project. It is essential to use treated timber where your project is exposed to the weather. C.C.A. Treated Timber – What Is It? Treated timber is used extensively both inside and outside houses and in landscaping. Treatment is carried out by impregnation of the timber, under vacuum and pressure, with C.C.A. preservative in accordance with Australian Standards. This preservative is in the form of a mixture of copper, chrome and arsenic compounds, hence the term C.C.A. After treatment the C.C.A. preservative becomes substantially part of the cellular structure of the timber. It can not be removed by weathering, rain, wetting, soaking or scrubbing. The treatment can never be washed out. Very simply, to make it last longer. 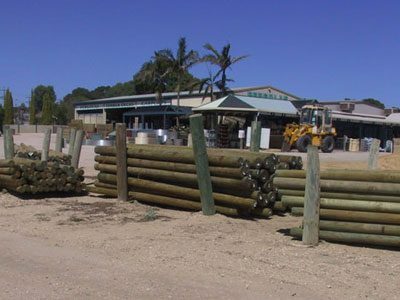 Many species of untreated timber are not suitable for use in the ground. C.C.A. treated pine, on the other hand, should last the full length of its intended working life. Yes, C.C.A. Treated Timber Is Safe To Use! The preservative chemicals are toxic to insects and fungi, which is, of course, their purpose. Provided the commonsense precautions are observed, preservative chemicals do not present a hazard to humans when fixed in the dried timber. Under normal circumstances, plants and animals in contact with C.C.A. treated timber will be perfectly safe. Care should be taken with certain specific applications such as birdcages, beehives and fishponds. For further information contact T.P.A.A..
* Wear gloves to help avoid splinters. * Cuts and abrasions should be protected from sawdust. * Wash hands and face free of sawdust before meals or smoking. * When sawing and machining treated wood, wear a dust mask. * When power-sawing and machining, wear goggles to protect eyes. * Sanding operations should be performed in well-ventilated areas. C.C.A. treated timber must never be burned. The best method of disposal is to take the unwanted treated timber to an approved tip site for burial. Dry C.C.A. 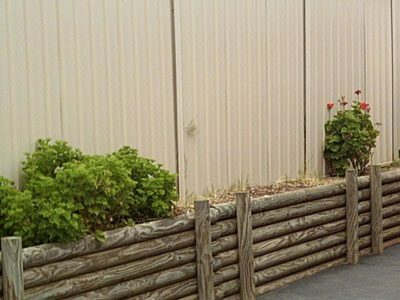 treated timber can be painted or stained in the same manner as untreated timber. If the timber is not surface coated it is recommended to minimise splitting and cracking by applying a liberable application of water repellent preservative. ACQ TREATED TIMBER HAS ARRIVED!!!!! ACQ (Alkaline Copper Quaternary) treated timber offers similar protection to CCA treated timber for decay fungi, termites & wood borers. ACQ treated timber is available in a vast range of timber products. ACQ can be treated to Hazard Level 3 or 4 (H3 above ground & H4 in ground). ACQ treated timber will initially have a greenish hue; this will weather to a honey brown colour over time. ACQ treated timber can be painted or stained. Nail Fasteners and Fittings – use only hot dipped galvanized, stainless steel, or other fasteners and hardware as recommended by the hardware manufacturer. Direct contact of NatureWood preserved wood with aluminium is not recommended. Osmose Australia Pty Ltd is the producer of ACQ preservative. Osmose offers a 50 year limited guarantee on the durability of properly treated ACQ. For the guarantee to apply, the timber must be treated in accordance with the national treatment standard AS1604. For further information contact your timber supplier.